Are you looking to bolster your home security? The team here at Gifted Geek has trawled the web and found what we believe to be the best home security products on sale. We firmly believe that to effectively secure a property, more than one product is required and that’s why we’ve selected 26 of the best. Many of the products listed below are affordable and can be fitted DIY to improve your home’s security. All of the security-related products listed on this page have been curated and independently chosen by the awesome folks behind Gifted Geek. This internal camera is perfect for keeping an eye on what’s going on inside your home. Footage is recorded in vivid 1080p high-definition, also receive notifications directly to your phone, speak via a microphone and you can even tilt and pan the camera for a complete wide-angle view of your property. 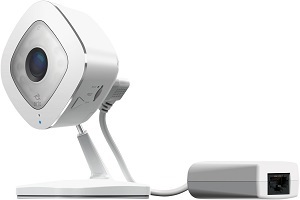 This camera also records with infrared night vision and has an advanced motion detector to save storage space. 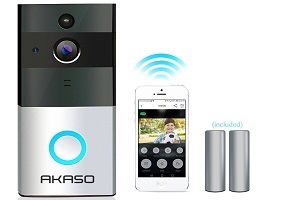 This modern security doorbell is jam-packed with advanced features including a wide-angle camera, 8GB of memory built-in storage, app connections so you can view people on your doorstep via your phone, night vision and a movement sensor so the camera only records when it needs to, thus saving battery time. There are many similar doorbells on the market but this was the best in terms of price and features. This solid steel anchor point is designed to be set in concrete at ground level and provides a suitable heavy-duty anchor point for valuable items such as cycles and motorcycles. Use this anchor point in your shed, garage or even on the driveway, in fact, this product can be used anywhere with a hard surface where you can set this product in concrete. 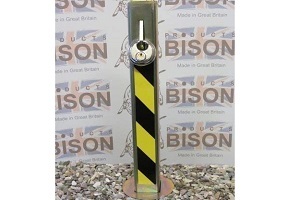 This British made security post is telescopic and sits flush and discreetly with the ground when not in use. 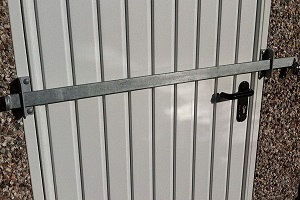 It has many uses including as an anti-ram device, to block entry to a driveway, to prevent thefts of caravans and trailers or to deny access through a garage door. 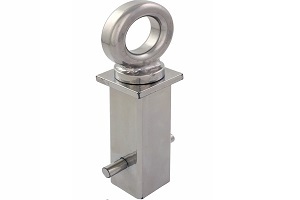 Made from hard steel, this post acts as a solid bollard when erected. This dual function security bar is made from hardened steel and has rubber ends to protect your doors and flooring. 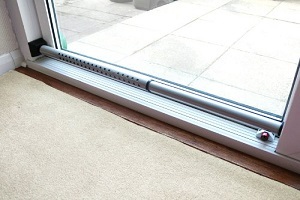 Use this device to prevent patio doors from sliding or as a front door jamb. This product is tested to 150kg of pressure and provides you with extra peace of mind that intruders won’t be able to brute force open your doors. 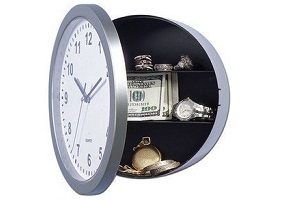 The perfect place to hide cash and valuables is somewhere thieves wouldn’t think to look. What are the chances of a burglar wanting to steal a worthless tin of beans? 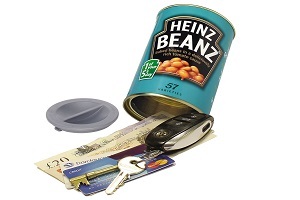 This specially created can of beans has a rubber stopper at the base and it can hold cash, jewellery and other small items. Other products in the range include tomato soup, an aerosol and a dictionary. A sturdy home safe is the best place to securely store valuable items such as jewellery, passports and documents along with cash and anything else that thieves might look for when rummaging through the property. These safes are made from hardened steel and are usually bolted to a wall or floor for added security and are protected with a pass code opening system. 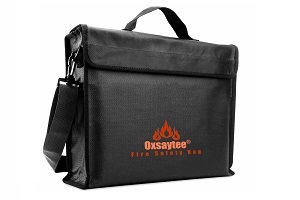 This document bag is designed to protect your valuable paperwork, passports, small devices, laptops and even jewellery in the event of a fire. Made from fibreglass nylon on the outside and aluminium lining in the inside, this A4 sized bag protects the contents from temperatures up to 1000°F. The team here at Gifted Geek was impressed by the quality of this bag, it’s heavy duty and sturdy. These devices are made from two parts; a siren box and a connector. 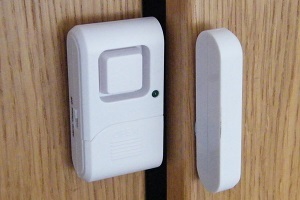 They are simple but effective, when the connector moves away from the box, perhaps as the result of a door, cupboard or window opening, the siren is triggered. These are perfect for doors, windows, wardrobes or other areas you want to protect. This approved fire safety and first aid kit is the perfect complement to other security products we’ve listed here on our security guide. Protect yourself and your family from fire with this affordable kit that is designed to be stored in the kitchen. 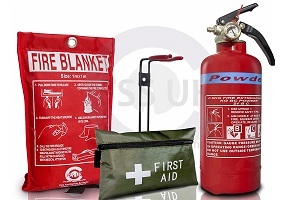 The kit contains one fire blanket, one fire extinguisher and also one first aid pack. Perfect for flimsy and weak garden shed doors and also garage side doors, this sturdy hardened metal locking bar adds an extra layer of security to your property. Secured with bolts at each end and requiring only a padlock to secure it, this is a simple yet effective addition to your security arsenal. When it comes to security you can never have too many external lights and the brighter the better. These solar-powered eco lights are triggered by movement and because no wiring is required, they can be fitted in areas away from the property where wires can’t reach. 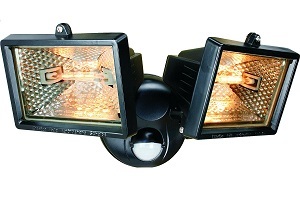 These solar-powered lights can complement other security measures you have in place. Door letter boxes are one of the easiest and most common ways for burglars to gain access to a property or to steal nearby keys and make off with any vehicles parked on the driveway. 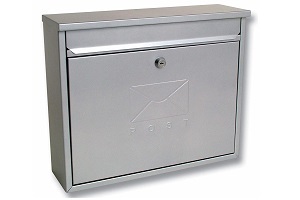 Get rid of the door letterbox flap and replace it with and a sealed metal box to secure your post and eliminate any chance of thieves gaining access to your home via the letter box hole. 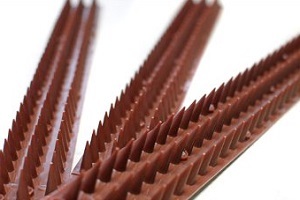 These hardened plastic wall and fence spikes are affordable, easy to install and help to deter thieves from gaining access to your property over walls and fences. They are available in several colours so you can choose one that will blend in neatly with the surrounding area. We recommend using these spikes in conjunction with anti-climb security paints and grease. Anti climb paint is a non-drying greasy liquid that makes it extremely difficult for intruders to climb over walls and fences. Perfect for fences and walls near public paces such as alleyways and car parks where intruders may try to enter your property. This liquid can be used with wall spikes and other similar security products. 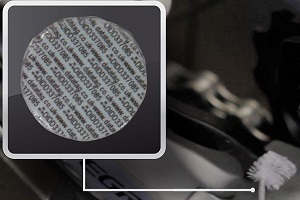 Years ago homeowners would etch or scratch their contact details onto the back of expensive items such as laptops and televisions so they could claim ownership if they were recovered after a theft. Nowadays, DNA tagging is the solution, tiny markers are attached to the items and these can be read by police scanners and other devices. 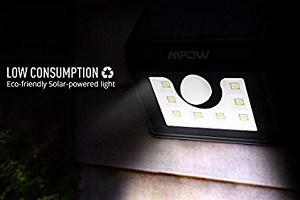 If there is one thing burglars dislike, it is bright glaring lighting and this motion detecting outdoor light has two powerful bulbs to help cast a light into your garden, patio or driveway. This simple, affordable and easy to install security device will deter many thieves and helps to secure your property at night and when it’s dark outside. CCTV systems have come down in price in recent years and a good quality setup, including hard drive, cameras and cables can be purchased for less than £200. By storing your own footage in a hard drive at home, you’ll save on costs as you won’t be using any cloud/internet based storage. 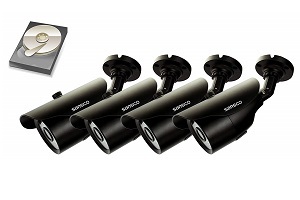 Check out the reviews of this popular CCTV system. Cloud-based CCTV systems store footage online for easy retrieval and unlike a hard drive, it can’t be destroyed in a fire or stolen by a thief. The downside is the cost, all cloud-based CCTV systems require a monthly or yearly subscription. The good news is that this cost is reducing year-on-year as online storage becomes cheaper and more common. 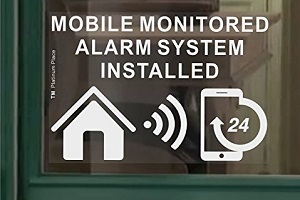 A home alarm system is a great way to deter burglars. Just having a visible box fixed to the wall outside of the home can reduce the chances of falling victim to opportunistic or planned crime. Hearing a loud siren will cause most burglars to flee and run. These systems can be installed DIY and are cost-effective at less than £300 for a typical property. 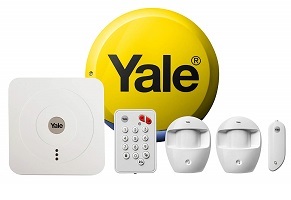 Don’t want the hassle of installing a real house alarm but still want to deter thieves? Try a dummy alarm box. These boxes look just like the real thing, are easy to install and help to put off burglars. Some products even come with solar-powered lights and this makes it impossible for intruders to distinguish them from the real thing. 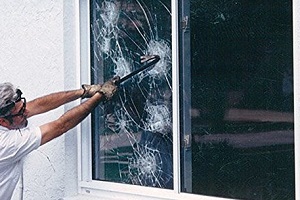 This shatterproof glass film adheres to either one or both sides of your glass windows and creates a shatterproof barrier. Upon impact, the glass shards will stay adhered to the film and won’t penetrate into the property. This protects the occupants from being cut and makes it much more difficult for intruders to gain entry. Also reduces harmful UV light. A significant number of home burglaries are committed not to steal items of value from the property but to get the keys to any cars parked on the driveway. 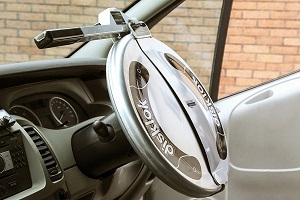 In addition to hiding keys in secret locations, a steering wheel lock can also act as a visual deterrent. 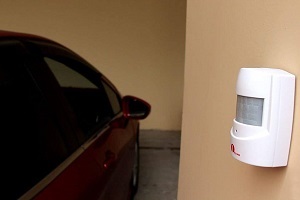 Devices like this tell would-be thieves you take home and car security seriously. The best way to secure car keys and other small valuables is to hide them out of sight where a burglar wouldn’t think to look. This looks bland, has no value itself but is perfect for hiding car keys. We suggest using this product alongside other security products listed in our guide to securing your home. 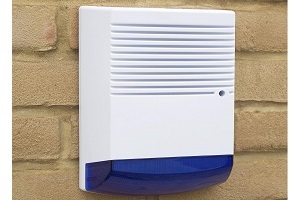 Perfect for carports and long or secluded driveways where you want a loud notification that someone is on your property. This device has several sensors and emits up to 100db of noise to deter thieves. Expand this external waterproof device with up to 50 additional sensors and multiple receivers. These security warning stickers can be placed on windows at vulnerable locations around the home such as the front and rear doors and any windows fronting a pedestrianized street. They work as an effective deterrent against opportunistic thefts from your home. Best used in conjunction with other security measures. What Do You Think of Our Home Security Products? 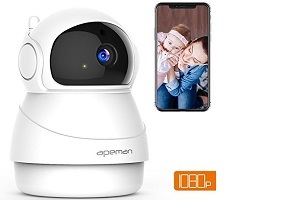 The team here at Gifted Geek have researched the best home security products on the market and produced this guide independently. All the items listed were curated in 2018. We think that to secure a property, more than one home security product is needed as thieves often use multiple vectors to gain entry. If you have a suggestion, perhaps an awesome home security product that we’ve missed from our curated list, you can contact us here. Where Would You Like to Go to Next?